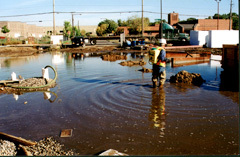 No on-site collection basins or management options. 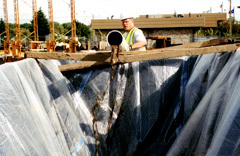 Low cost approach involved the placement of poly lined high-sided dumpsters for water storage and settling. A series of Biostar-CH Floc 500 bags were placed in line to treat water as it was pumped. The treated water was allowed to settle. Clean water was discharged and the remaining sediment was re-distributed on site.